Store all your Letter It Medium Pens, Fineliners, Embossing Powders, Perfect Pearls and more in this stylish new Letter It Accessory Bag! 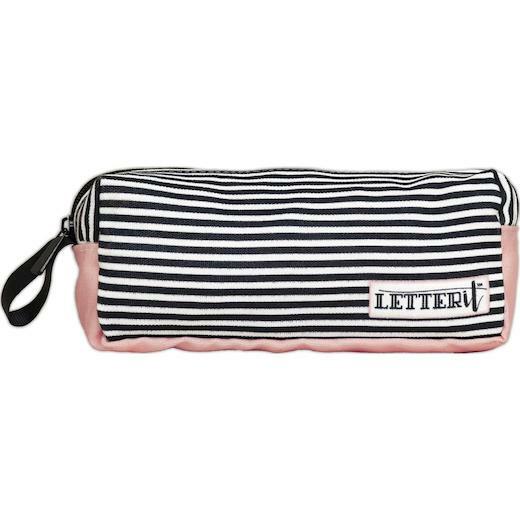 Featuring the signature Letter It black and white stripes with a subtle pink bottom, this zippered bag makes storing your favorite products super easy. Measuring 200mm (8”) L x 90mm (3½”) W x 70mm (2¾”) H, this custom designed canvas bag features a zipper and is ideal for storing inks, pens, brushes and more.